[Jenkins, Will F.]. The Gamblin' Kid. New York, NY: Alfred H. King, 1933. Mexican Trail. New York, NY: Alfred H. King, 1933. (AKA Dead Man’s Shoes. First pub. in three parts in West, March 4, 18 and April 1, 1931). [Jenkins, Will F.]. Fighting Horse Valley. New York, NY: Alfred H. King, 1934. [Jenkins, Will F.]. Outlaw Sheriff. New York, NY: Alfred H. King, 1934. (AKA Rustlin' Sheriff). [Jenkins, Will F.]. Rustlin' Sheriff. London, UK: Eldon Press Limited, 1934. (AKA Outlaw Sheriff). [Jenkins, Will F.]. Kid Deputy. New York, NY: Alfred H. King, 1935. (Pub. in three parts in Triple X Western, February-April 1928). [Jenkins, Will F.]. “The Kid Deputy.” Triple X Magazine, (three-part serial, February-	April 1928. Pub. in book form by Alfred H. King, 1935). [Jenkins, Will F.]. Black Sheep. London, UK: Wright & Brown, 1936. (Pub. in Adventure, January 1, 1928). Guns for Achin. London, UK: Wright & Brown, 1936. (See Collections). Two Gun Showdown. New York, NY: Astro Distributors, West in Action, 1948. (AKA The Gamblin’ Kid). Texas Gun-Law. New York, NY: Quarter Books, 1949. (Abridgement of Black Sheep). Texas Gun Slinger. New York, NY: Star Books, 1949. (Abridgement of Fighting Horse Valley). Wanted Dead or Alive! New York, NY: Quarter Books, 1949. [Jenkins, Will F.]. Dallas. New York, NY: Fawcett, 1950. (Novelization of screenplay by John Twist). Outlaw Deputy. New York, NY: Star Guidance, 1950. Outlaw Guns. New York, NY: Star Books, 1950. [Jenkins, Will F.]. Son of the Flying Y. New York, NY: Fawcett, 1951. [Jenkins, Will F.]. Cattle Rustlers. London, UK: Ward Lock & Company, Ltd., 1952. High Jinks in Denver. Western Story Magazine, April 30, 1921. Romanced to Freedom. Western Story Magazine, January 27, 1923. Howdy! West, January 20, 1926. The Owner of the Aztec. Western Magazine, May 5, 1926. Six Guns Across the Border. West, September 15, 1928. Dead Man's Shoes. West, (four-part serial, March 4-April 15, 1931. AKA Mexican Trail by Will F. Jenkins, Alfred H. King, 1933, and filmed as Border Devils, Supreme Features, Inc., 1932). The Two Gun Kid. Triple X Western, (four-part serial, July-October 1931). The Sheriff Was a Runt. West, April 27, 1932. A Buckaroo Rides. Triple-X Magazine, June 1932. The Mystery of Renegade Range. Triple-X Magazine, August 1932. The Spook Rustler. Five-Novels Monthly, October 1932. Death Rides with the Kid. All Western, May 1933. Pete Rides His Luck. Cowboy Stories, November 1933. The Battle of the Bunkhouse. Thrilling Western, November 1934. Trouble on the Bar-Q. Danger Trail, November 1934. The Calidad Holdup. Cowboy Stories, September 1935. [Jenkins, Will F.]. The Gamblin’ Kid. 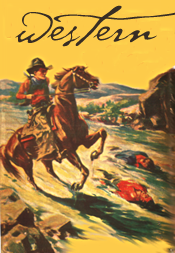 Western Action Novels, March, 1937. (Published in book form by Alfred H. King, 1933). [Jenkins, Will F.]. The Ending of El Jefe. Real Western, April 1937. [Jenkins, Will F.]. Rustlin' Spooks. Smashing Western, April 1937. [Jenkins, Will F.]. Hell for a Gringo. Famous Western, December 1937. Gunfighter. All American Fiction, January 1938. [Jenkins, Will F.]. The Law of the Six-Gun. Smashing Western, January 1938. [Jenkins, Will F.]. The Trail to Mexico Runs Red, Double Action Western, June 1938. [Jenkins, Will F.]. Border Renegade. Cowboy Short Stories, October 1938. [Jenkins, Will F.]. The Law Wants Slim Galway. Double Action Western, June 1939. Deputy. Thrilling Western, September 1943. By the Guns Forgot. Fifteen Western Tales. December 1947. Hell-Roarin's Range. Real Western Stories, October 1951. [Jenkins, Will F.]. The Sheriff Deals in Facts. Esquire, November 1952. A Killer for Tombstone. Western Tales Magazine (British), September 1953. The Last Grubstake. Fifteen Western Tales, May 1958.